Great start to the season, with snow down low and up high for a change. It’s been a long time since we’ve had this sort of base down low. Snowpack ranges from 1-5 feet, depending on your elevation and aspect. The storms that hit just after Thanksgiving provided great coverage, wet mucky snow and then lighter on top. The skiing has been great for two weeks. Really unbelievable conditions for the first week of December. The skiing is still good, as temps have remained cold and snow quality high. This said, we have some areas of instability throughout the area, and backcountry skiers/riders should be aware. With the unusually constant cold temps (for Tahoe) we have had a lot of surface hoar. And while not tremendously windy, we have had some wind that has created small slabs over some surface hoar areas. These slabs can fail easily. They have not shown propagation into larger slides yet, but if set off in the wrong spot, they are large enough to cause really bad consequences. Think about where surface hoar and wind loading have and will occur, and adjust and test accordingly. We have strong winds coming in this Friday. As for snow, we have a small system doing in Sunday-Monday that should bring 2-4.” Beyond that the model runs are looking dry. 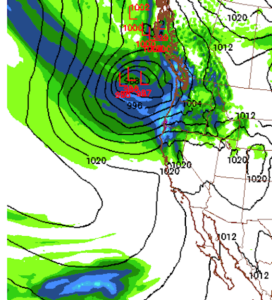 Really nothing but splitting storms that won’t really affect Tahoe nor bring any significant snow in the next two weeks. 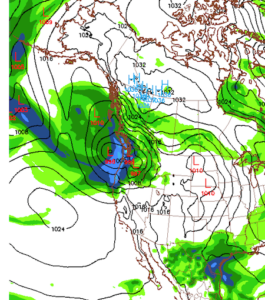 The various models fluctuate, some dry, some showing storms returning for Christmas. Right now it’s very uncertain what will happen. If you utilize your local avy center’s resources, including their daily reports, consider helping them out. Most of these centers operate on fairly limited funding and need our financial help to get the report out every day. Visit the Sierra Avalanche Center, which services the Tahoe area and provides daily navy conditions updates, weather-related info, and classes. This group does an excellent job and is a vital resource for anyone heading out of bounds.